Home PC Mac How to find the apps install date on your Mac? Ever wondered how and when you downloaded an alien app on your Mac. Have you ever needed to check what all apps you have installed recently or when did you install a particular app which conflicts with something else on your Mac or you don’t remember what all apps you installed on a particular date after which such problem started? . Well, there is also a possibility that you downloaded and installed some unwanted software on your mac when you clicked on a sneaky link by mistake. So in order to troubleshoot this, you try to find “app install history” from the installation log. In this article, I will guide you through a very simple step without the use of any third party app to find out the exact date when an app was installed or you can pull a list of all the installed applications sorted by their installation date. This information can be useful in many situations like compatibility issue with an old app, or when you need to decide on keeping only the new useful app and removing the older app that you have not been using for a long time or while troubleshooting when you need to know an app install date on your Mac. 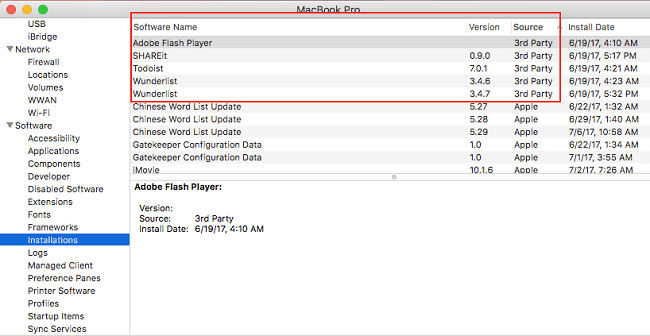 Before, we follow the steps to find out the app installation date on Mac we must know how these information are recorded. 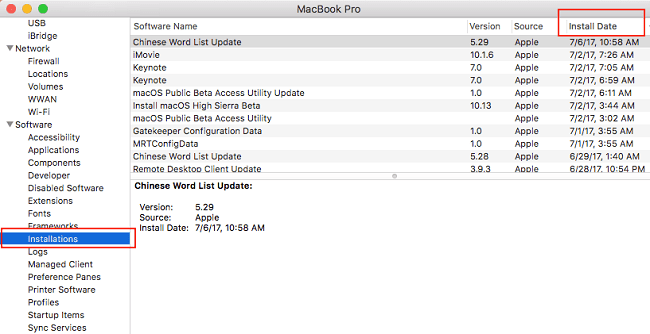 How are app install date recorded on Mac? Every app, even the operating systems like macOS or Mac OS X create an installation log files which update the system setting and copy the file in log folders during its installation. This log files basically store the date and time when that app was installed and whether the installation was successful. You can also find such a list of apps with install date and time in /Library/Receipts/InstallHistory.plist file, but this file is written in XML format so it would be little tricky for you to read all the information there. But don’t worry we will find the liat of all the application with their install date, version and source easily from a different place. Note :- Remember that you might not get the correct installation date information, if you have reinstalled your macOS version or have run a utility like OnyX to clear logs and cache histories because such utilities wipe those information out. Viewing App Installation history on a Mac back in OS X 10.7 Lion was different from new OS X Mountain Lion and above. Click on the Apple logo at the top left corner of the screen. Click on “Installed Software” tab. It will show you the list of all installed software with their name, version and the date it was installed on. Click on the Apple logo at the top left corner on your screen while holding down the “Option” key on your keyboard. This will change “About This Mac” to “System Information” so select System Information. Now scroll down the list on the left pane and select “Installations” under the Software section. This will show you a complete list of all software currently installed on your Mac, including OS X and any updates. On the right top half of the window, you can see the list of all the installed app with their install date, version, updates and their source whether they came from App Store or from a third party vendor. If you wish to see these app in the order they were installed on your Mac, then simply click the “Install Date” column name on the top right sort them by their install date. If you wish to see all the third party app installed on your Mac then simply click on the “Source” column to sort them by their source. You can also watch this YouTube video on how to find the Apps install date or installation history on Mac. Remember that some third party app which are not downloaded from the App Store and which are not from Apple identified developer will not be able to add its install date entry here. For example, Adobe Flash Player is a third party app but it is an identified developer by Apple so it will show up here but an App name “Handbrake”- a video conversion tool which is a third part app too but not from an Apple identified developer is not gonna show up here. Open Finder and click on the “Go” menu at top and select Application. You need to first enable list view option by clicking on “View” menu at the top and selecting “as list” or simply press “Command+2” keys. Now click on the “View” menu at the top again and select “Show View Option” or just press “Command+J” keys. 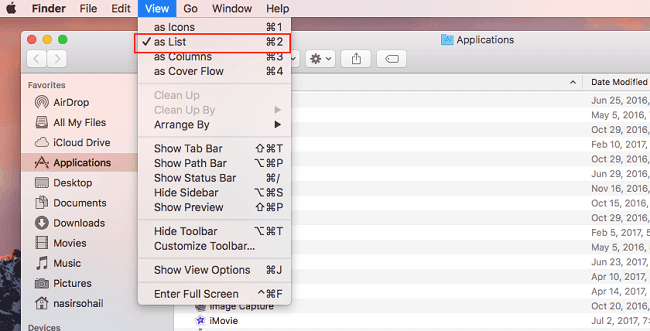 This will open a new control window which allows you show or hide any column in the finder. Select the checkbox for “Date Added” under “Show Column:” list. 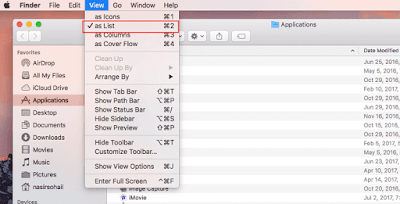 This will show you a new column name – “Date Added” for the Apps list so simple click on the column name to sort them by the date they added or installed on your Mac. This Date Added is the original install date of an App on your Mac. So that was all about “finding the app install date” on your Mac. This can be very helpful in troubleshooting your Mac. Please comment below if you have difficulty finding the same on your Mac. Previous articleHow to find your Mac Model?